Was in Chicago this weekend and on the way out made it to the Adler Planetarium. We took in the film on Black Holes which was amazing. But seeing all the Vintage astronomy equipment was very interesting. Unfortunatly since we were on our way home we were rushed but still impressive none the less. we were so hurried I forgot to take the camera in but will probably be going back later this summer so I will be more prepaired. 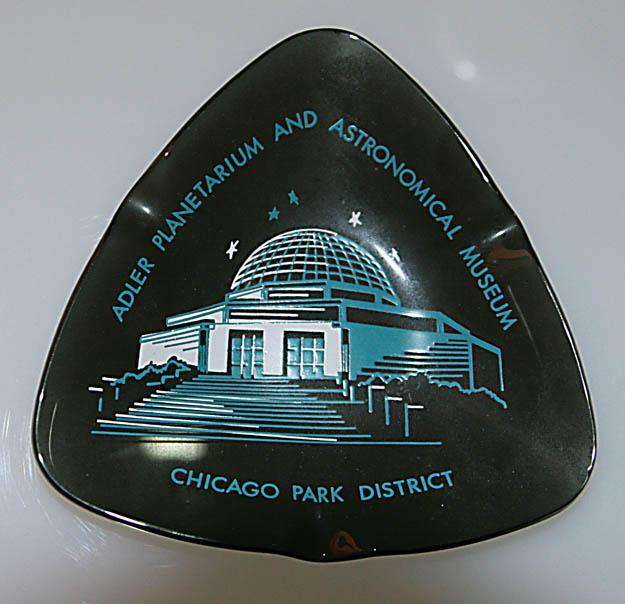 This isn't exactly the picture you were hoping for, but it's a picture of Adler Planetarium just the same. It's an ashtray I purchased at Adler in 1963 or 1964 while stationed at Chanute Field, near Rantoul, Illinois. Ah Chanute the closed the base right before i was suposed to go to a school there that was a joint navy air force school kinda bummed me out since it was close to home.